"Giorgio Pelissero" has been on a roll over the last few years. Every wine that emerges from this cellar is now fabulous, which places Pelissero in the top echelon of Piedmont producers. Stylistically, the wines are super-rich and concentrated, but also impeccable in their balance." Antonio Galloni Oct 2013. Winemaker, or should we say, wine-grower, Giorgio Pelissero has been winning over hearts and minds of critics and sommeliers alike. 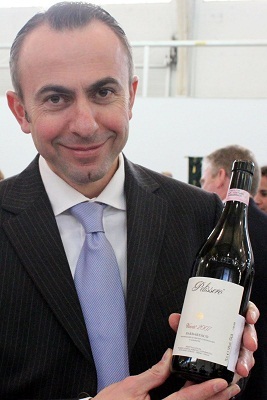 Photo at left shows him at the 2011 Gambero Rosso event where he yet again took out Tre Bicchieri (3 glasses) for his Vanotu Barbaresco. Not surprising when you consider he has some of the most prized vineyards originally planted by his grandfather. He is quite a character with a captivating, charming personality that wins people over in minutes - just like his wines. All his wines are exceptional with each showing their beautiful terroir characters.